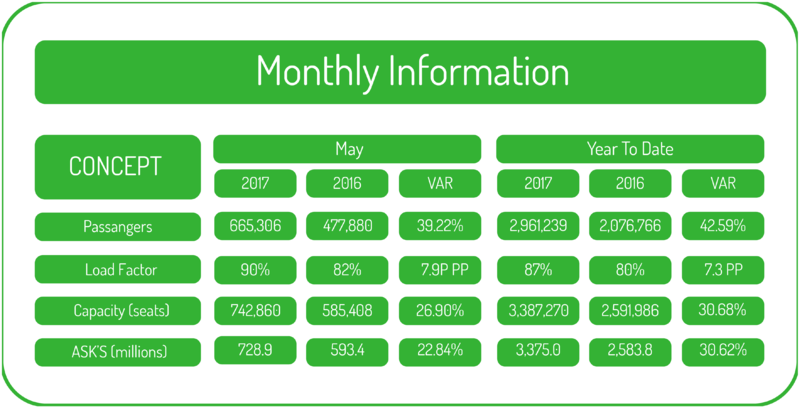 In May 2017, the traffic of Viva Autobus grew by 39%, compared to the same month of the previous year, to more than 600 thousand customers. So far in 2017, the traffic of Viva Aerobus increased by 43%, compared to the peri-od January-May 2016, to nearly 3 million passengers. The load factor reached 90% in May 2017, an increase of 7.9 percentage points compared to May of the previous year. Viva Aerobus increased its capacity, measured in available seats, by 27% compared to the same period in 2016. It is the holding of several companies, including the airline Viva Aerobus. Viva Aerobus is Mexico's low-cost airline. It started operations in 2006 and today operates the youngest Latin American fleet with 21 Airbus 320, including two A320neo on 75 routes and 33 differ-ent destinations. With a clear vision to give all people the opportunity to fly, Viva Aerobus has de-mocratized the airline industry with the lowest rates in México and the lowest costs in Latin America, making their flights the best value offer.